The differences between interior and exterior paints have become more important in 2015 than they were two decades ago, when painting pros considered them virtually interchangeable. 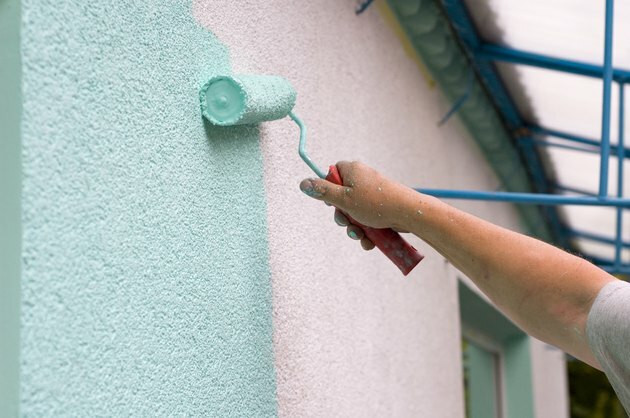 Exterior paints have to withstand sun and weather conditions without peeling; whereas, interior paints must resist abrasion. One of the most important differences, though, is their relative level of volatile organic compounds, or VOCs. Paints with higher levels of VOCs are reserved exclusively for use outdoors. A man painting the exterior of his home with a roller. 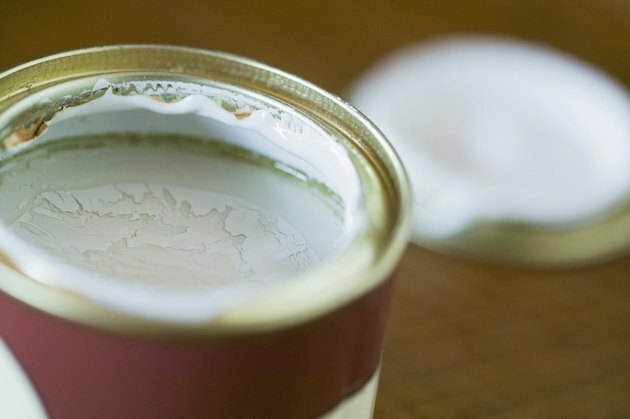 A close-up of a freshly opened can of paint . 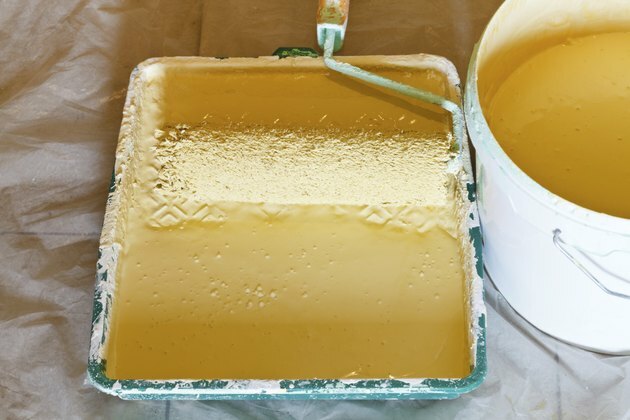 A can of paint contains a soup of ingredients that results in a hard, protective coating for wood, metal, concrete, drywall and other surfaces. While the chemicals that form the coating are in the can, they are suspended in a solvent that evaporates after the paint has been applied. These coating chemicals include polymers, which actually form the surface; binders, which prevent it from separating and provide the ability to adhere to the painted surface, and pigments for color. Paints also usually contain additives to regulate drying time, improve weather resistance, control mildew and keep the pigment uniformly distributed in the paint solution. A bucket of paint next to a tray and roller. Until latex paint was developed in the 1940s, the most common resins in paints were alkyds derived from plants. Alkyds are large, heavy molecules that are almost inert but retain enough reactivity to combine with oxygen and cross-link with each other to form a hard film. Latex paint, on the other hand, contains a combination of natural or synthetic latex rubber and acrylic plastic. Acrylic is a hard plastic, but the presence of latex adds flexibility. Alkyds are soluble in turpentine and mineral spirits -- a petroleum product -- but acrylic latex is soluble in water. 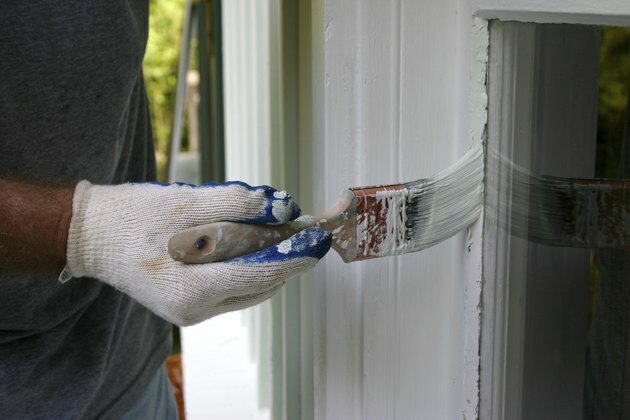 A close-up of a man painting the window trim white. Although you can find latex paints for both exterior and interior use, alkyd paints are generally sold only for exterior use, and many states, led by California, prohibit the use of these oil-based paints indoors. Oil-based paints off-gas significant levels of VOCs for several days after application, and off-gassing can continue for years. Because of this prohibition, sales of oil-based alkyd paints have fallen sharply. Moreover, state regulations require it to be available only in limited quantities, so alkyd paint is generally available only in quart cans, making it more troublesome and expensive to use. Alkyds produce a sharper, more glossy finish than acrylics, though, so many painters prefer oil-based paints for exterior trim and woodwork. 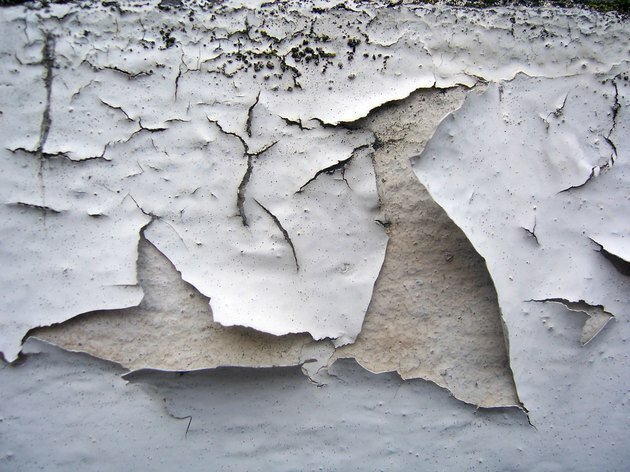 A close-up of peeling paint on an exterior wall. You can use an exterior latex paint for your kitchen or living room walls, but you probably don't want to. The binders and additives in exterior paint are designed to withstand harsh conditions, and the coating is generally thicker and less decorative than an interior latex finish. Conversely, an interior latex product simply wouldn't last long if you used it to paint the side of your house or a fence because it lacks these heavy-duty additives. Even if the color didn't fade in the sun, which it probably would, the paint itself would deteriorate quickly, and you'd find yourself repainting in a short time. What Are the Differences Between Airless & Air Sprayers?